The new Quadro M5500 is not only the fastest mobile Quadro unit, but also meets the hardware requirements of HTC Vive and Oculus Rift VR headsets. Nvidia has unveiled a new SKU for high-end desktop replacement laptops - the Quadro M5500. 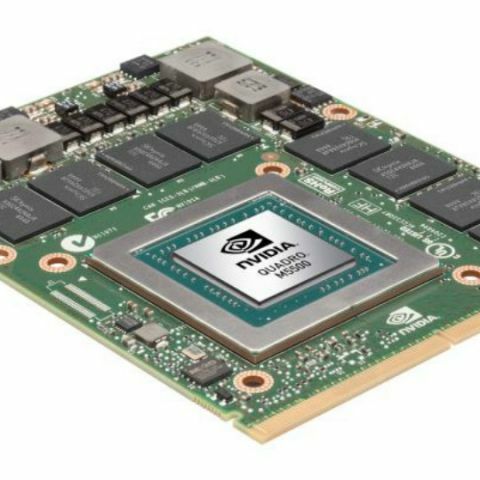 The Nvidia Quadro M5500 packs in a fully-enabled GM204 GPU, complementing it with high Thermal Design Power (TDP) of 150W. It has 8GB of DDR5 VRAM, running at memory clock of 6.6GHz. The GPU has a boost clock of around 1140MHz, and is based on the Maxwell 2 architecture. To translate the technical detail, the Nvidia Quadro M5500 is an incredibly powerful graphic rendering unit that is capable of producing desktop-class graphics. However, with the increase in TDP from 100W to 150W, the Quadro M5500 is much more power-hungry, and as such, requires better cooling mechanism to keep it functioning properly. It will feature in MSI’s WT72 mobile workstation, which uses Intel’s Mobile Xeon CPU in combination with the Quadro M5500, and present the world’s first mobile VR experience when combined with an HTC Vive, or Oculus Rift headset. The MSI WT72 Workstation also houses a 17.3-inch display with 3840x2160-pixel (4K) resolution, along with 256GB of Super RAID 4 SSD, 1TB 7200rpm HDD, a Blu Ray disc burner and Windows 10 Professional. It weighs 3.81 Kgs (8.4 Lbs), and is priced at $6,900 (Rs. 4,59,300 approx). The Nvidia Quadro M5500 houses 2048 CUDA cores, up from 1536 cores in the Quadro M5000M. The higher VRAM, along with higher processing power in terms of cores and running frequency, will lead to much enhanced gaming and visual performance out of the GPU. The cost factor, however, will mean that the first ever mobile VR station will remain only in the hands of enthusiasts and VR developers. The Quadro M5500 will also stand as a backbone of Nvidia’s professional VR plans for the future, giving it a platform to build for the future array of VR-laden devices and platforms.